This was one of the dish that i cooked during CNY, even brought to a family gathering. I just simply twisted from the French cuisine orange duck breast to this Chinese version. I am glad that it turned out good especially the gravy has a bit of tangy flavor from the oranges used. 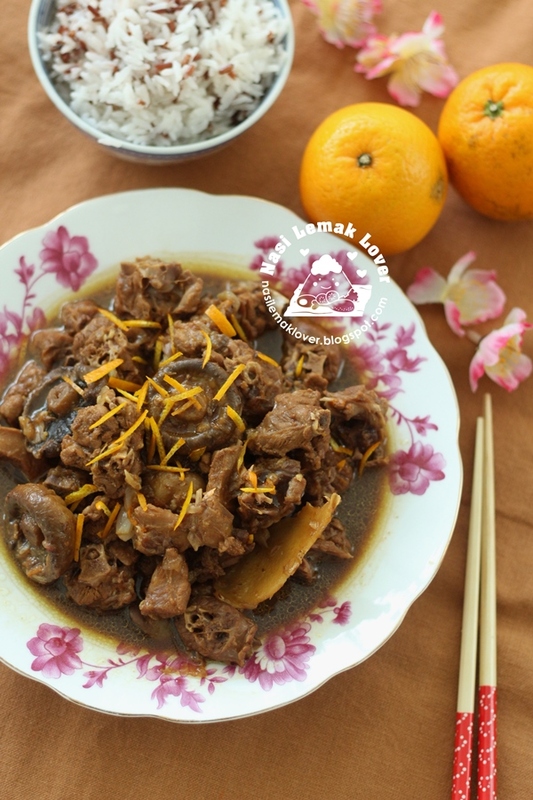 Chinese style Braised Orange Duck????? 1tbsp light soy sauce1tbsp dark soy sauce1/2tbsp oyster sauce1/2tsp salt or to taste MethodHeat oil in a pot or wok, sauté shallots, garlic and ginger till aroma.Add in duck meat and button mushrooms, stir to combine and cook till colour changed.Add in 1/2tbsp orange rind, orange juices and water, bring to boil.Add in all seasonings, braise over low heat for about an hour or till tendered.Dish out, sprinkle some orange rind on top, serve hot or warm with rice.